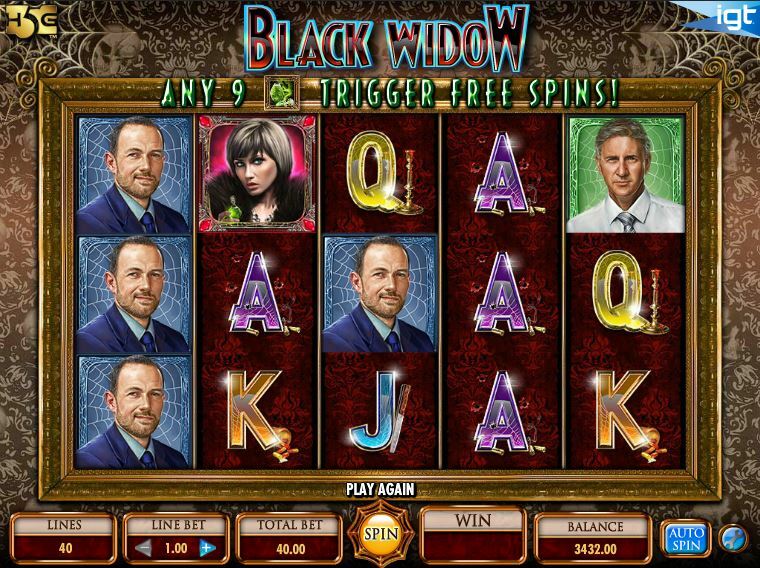 Black Widow is a game that applies the legend of the spider with the same name to a human situation, a woman being at the center of the story in this case. It’s not a game themed around the comic book with the same name, instead being about a woman that poisons her lovers. The game is special in more ways than one, the features being quite cool and the graphics also being up to the task. The game was designed by IGT. All the action takes place on 5 reels and with up to 40 paylines and just as many chances to get the big prize, worth $50,000. 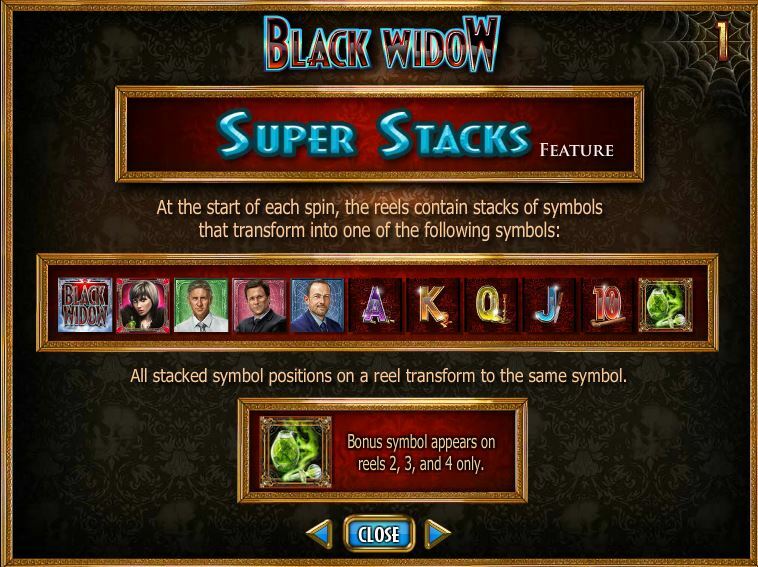 The super stacks improve the game tremendously, but you will also enjoy the Web Capture bonus, the free games and the wild symbols. The big stacks feature is an important aspect of the game, while others include a wild and a bonus that is capable of triggering free spins. A Web Capture feature is the icing on the cake in this case. 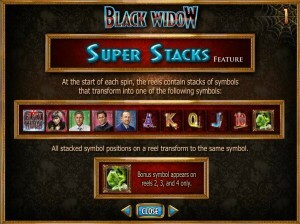 Super Stacks is the name of a feature in this slot, which is capable of bringing you entire stacks of symbols. Huge symbol stacks are part of the game, so there are excellent odds that combinations will be formed with their help. You will often find that thanks to the stacked symbols you will get multiple wins offered in the same round, even on all 40 lines at the same time. 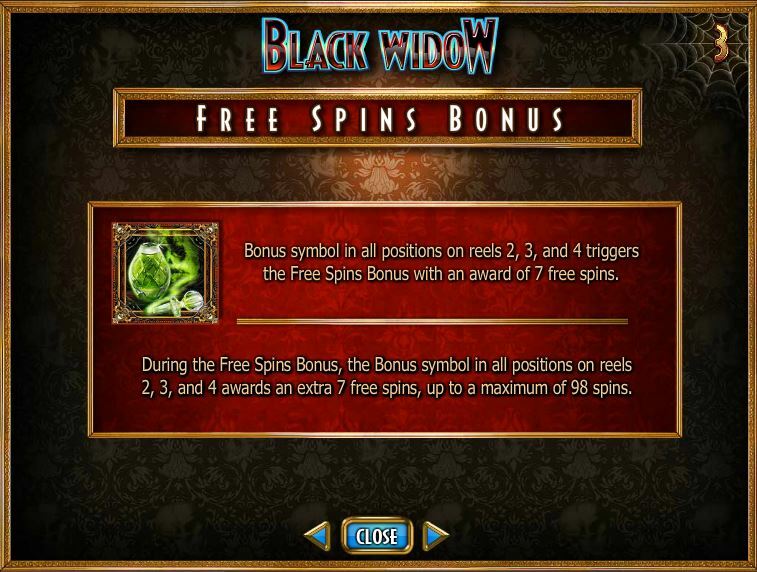 With the Black Widow Logo in place, you are getting a wild feature which is known for its ability to substitute for another symbol. 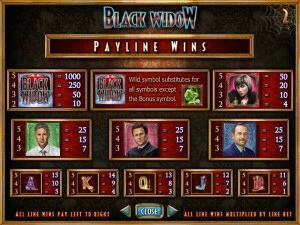 With the exception of the Bonus symbol, the Black Widow wild can replace any other icon in this game. It doesn’t have multipliers to give you, but its presence should be useful enough, especially when coupled with the use of stacks of regular icons. The bonus symbol is present on three reels out of five, the ones in the middle of the game area (2, 3 and 4). Having this symbol on all three reels will trigger a round of 7 free spins. 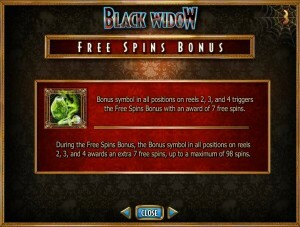 You can get additional sets of 7 spins for free each time you get the bonus symbol on those three reels. The most you can get this way is 98 spins. Whenever a symbol with a Male appears in the middle position of the 3rd reel, you will get a prize which is worth the same as the meter of that particular character. You can win from 2x to 1,000x the triggering bet when this happens. The meter’s value goes up with each male capture, so the more you play, the more this bonus feature will offer you. You can also get the Female character on that exact position, in which case you’re going to be paid what all three meters show you. Next, the meter’s value will go up for all three characters. You always wager on 40 paylines, there is no option to change this number. However, you can work on the line bet, going as high as $50 for a coin, with the minimum being $1. The resulting betting range is $40 to $2,000. While payouts only go up to 1,000 coins, meaning up to $50,000 cash, the presence of the Super Stacks allow you to get multiple winning combinations at the same time, up to 40 actually. I’ve enjoyed the game, thanks to the mix of luxury, highly detailed characters and spider related imagery that is used whenever possible, without becoming annoying. Beautiful tapestries with spider webs are visible behind the reels, which look like they’re encased in the frame of a painting. The painting like style of design is also visible in the images with characters, with three males and one female being present among the symbols. Playing cards look modern and they have a bit of a spider theme as well. 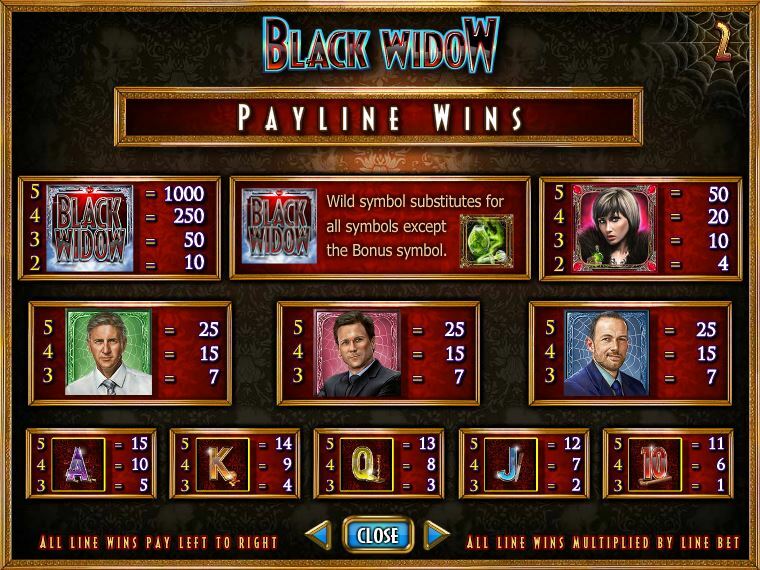 Symbols: Black Widow Logo (1,000 coins, wild), Lady (50 coins), Green Web Man (25 coins), Pink Web Man (25 coins), Blue Web Man (25 coins), Ace (15 coins), King (14 coins), Queen (13 coins), Jack (12 coins) and 10 (11 coins). I have found a lot of things to enjoy about this game, including the design, though I’m especially talking about the features. I’ve often gotten up to 40 winning combinations at the same time, the Super Stacks being very useful in that regard. 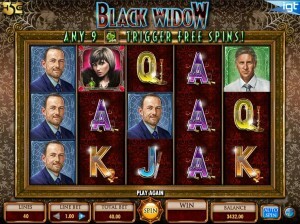 Black Widow can be found at any IGT casino, where you get a chance to play it for real money or in free mode.